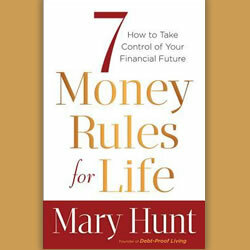 Book Spotlight: "7 Money Rules for Life"
If you made a resolution this year to get a better handle on your money, financial expert Mary Hunt is here to help with her new book 7 Money Rules for Life: How to Take Control of Your Financial Future (Revell Books). The author takes everything she’s learned over the past 20 years and boils it all down, resulting in a no-nonsense book that offers the keys for readers to get their money under control, and get themselves prepared nancially for the rest of their lives. Money mastery isn’t really that hard, she says, and 7 Money Rules for Life can help readers change their futures from uncertain to rock-solid with principles they can apply right away.